This entry was posted in African American History, American History, American South, Atlanta, Black Community, Conservation, Dominica, Environment, Exposition, intellectualism, misogyny, Opinion, Outside the box, Political Commentary, Politics, Puerto Rico, sexism, Social Commentary, Social Consciousness, The U. S. Virgin Islands and tagged Atlanta, christmas, Dominica, downtown Atlanta, fog, homeless, homophobia, Jesus Christ, misogyny, new years, Peachtree Street, Puerto Rico, racism, sexism, steeples, Virgin Islands by Leslye Joy Allen (Ayọ). Bookmark the permalink. Metaphorically speaking, this is the best metaphor for a foggy mind that I have ever read. All the best to you in the coming year. Thanks Michael. 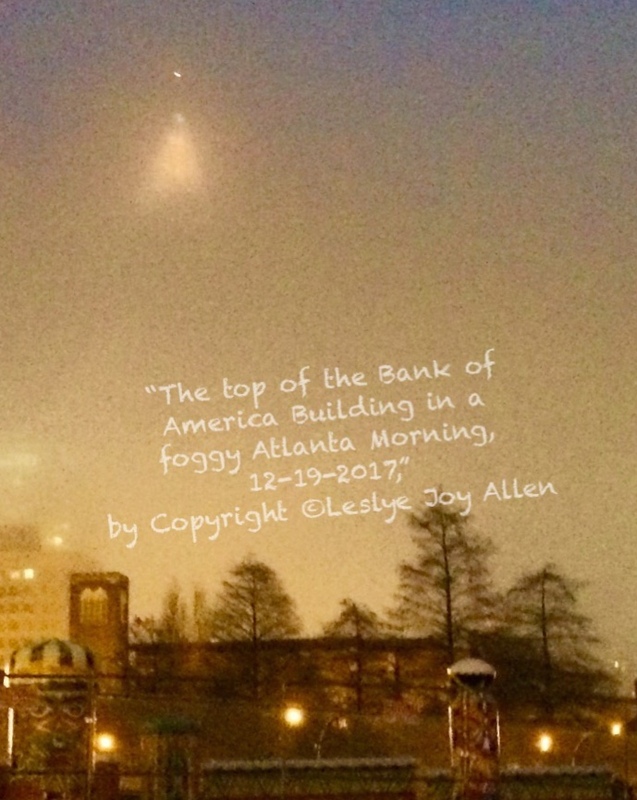 I consider your praise “high praise.” The fog was so dense this morning in downtown and the first thing that hit me was that “steeple” and it kind of went from there. You had good presence of mind to reach for your camera at that precise moment. What are the chances that scene will repeat himself in the next 100 years. Kudos to you for the photo as well. I took the shot from the car while at a traffic light at Ralph McGill and Courtland! All the more amazing. I love this picture.